Ages: 3 – 6 years old when class begins. 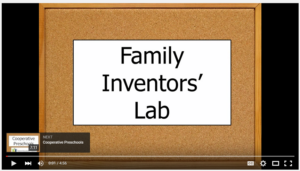 Watch our video to see what our Family Inventors’ class is all about! Our kids are true digital natives and have known how to “swipe” a touchscreen since before they knew how to walk. Technology will always be a part of their lives. But if you talk to the engineers who designed and built that technology, most will tell you of childhoods spent running outside, digging in sandboxes, taping cardboard boxes together, building blanket forts, and a lot of time with Legos, Lincoln Logs, erector sets and more. The inventors of tomorrow will come from the kids of today who have that same interactive experience with the real world – hands-on, child-led, diverse play with all five senses engaged. Our Saturday classes focus on those types of experiences. We are a parent-child / cooperative class, where parents and children play, learn, and grow together. We are a STEAM enrichment class – that’s STEM with the arts mixed in. Science exploration: although the theme changes each week (see below), every week has hands-on exploration of scientific concepts that let children discover ideas and then deepen their understanding through further exploration. Construction projects: big blocks, giant tinker toys, Lincoln logs – every week we have construction materials available to inspire kids to build. Art exploration: painting, collage, play-dough, and more allow children to build small motor skills, enrich their creativity, and become familiar with art materials. Circle time: songs, stories, and group games build literacy, musical skills, math skills, and give kids practice with sitting still, paying attention, and following the rules. Outdoor time: On campus, kids have the opportunity for playground and sandbox time (sometimes we substitute indoor activities during winter quarter). When we meet at Robinswood, we spend a large chunk of class time out in the woods, learning about nature and wilderness skills. Let’s explore science! Join us as we gaze at stars, simulate earthquakes, change the states of matter, and make things go boom! Our science sessions explore fundamental ideas from the physical sciences. We’ll study geology, paleontology (dinosaurs! ), astronomy (planets, stars, and space travel), physics (gravity and magnets) and chemistry (states of matter and reactions.) The focus is on INQUIRY. We’ll follow these steps of the scientific process: observe, ask a question, make a guess, test it, and tell others what we learned. Our engineering sessions focus on building skills. We’ll study the six simple machines, learn about electricity, practice using the Tool of the Week, and build towers, tunnels, bridges, houses and model cars. The focus is on Tinkering and the PROCESS of creation and problem-solving: we’ll figure out goals, make an initial plan, build the first prototype, test it, then improve it, test and improve it again. This design process teaches kids that they don’t have to create a perfect product on their first try, but whatever they create, they can always keep working to make it better. Let’s learn about the world around us! We’ll hike in the woods, play in the mud, and learn about animals, birds, bugs, and plants. Our nature sessions explore the life sciences, as we study the human body, animal adaptations, sea life, insects, and more. The key focus is on OBSERVATION skills. We’ll use all five senses to explore and we’ll learn how to describe what we see, and group items into categories based on various criteria. But, since we’re the Family Inventors Lab, we’ll also talk about how humans have developed inventions and tools based on what they see in nature. Field Trip: Farrell McWhirter Park in Redmond or Kelsey Creek Park in Bellevue. If you want to see all the activities we do in class, they’re all documented on our parent educator’s blog: www.InventorsOfTomorrow.com. Location: Most weeks, we meet on the Bellevue College campus, in our Creative Development Lab in Q116. On the third Saturday of each month, we meet inside the barn at Robinswood Park, the site of our Discovery Science Lab class. This class includes a monthly Parent Education session, led by a parent educator, which covers topics like early learning, discipline, brain development, and ways to support your child’s learning throughout their childhood. Parents share experiences, offer support, and build friendships. This is a parent cooperative program. You should expect to be in the classroom about half of the days that your child attends. Attendance at monthly parent ed sessions is required. You will also be asked to work in the classroom 3 times a quarter – approximately once per month. Classroom tasks include: supervising children for safety, providing and serving snacks, classroom clean-up, and, most importantly, playing along with the children as they invent new games and explore new construction projects. We welcome dads, moms, grandpas, and grandmas to attend – any adult who expects to attend regularly will be asked to attend an orientation session to learn classroom policies. On non-work, non-parent-ed days, you are welcome to stay and play, or you can drop off your child and use the time to catch up on the weekend’s business, go on a date with your partner, or just relax! You can schedule a visit during a class meeting time by contacting the instructor listed on the schedule or by contacting the registrar. To register for a class, go to our online registration form or call our registrar at 425-564-2365. You’ll register for class #7099 (Saturday morning) or #7093 (Saturday afternoon). The activities in this class are best suited for 3 – 6-year-olds. We welcome children who are 2.5 to 3 (as of August 31) or as old as 7, but only if they have a sibling 3-6 years old enrolled in the class. Tuition cost is $245 per quarter (fall, winter, and spring). If two children attend from the same family, the total per quarter for both children is $409. Our 2018–19 program runs from September 2018 to June 2019. Tinkering: Why is tinkering important? http://tinkerlab.com/why-is-tinkering-important/ and Tinkering is Serious Play: http://tinyurl.com/TinkerSerious.